Since sharpening is such an expansive topic in and of itself, I will leave the specific how-to details for other posts. What you need to know in the context of fine tuning, however, is that any plane, new or old, requires initial sharpening and honing. At a minimum, new plane irons need to have their un-beveled side flattened and polished to at least 4000 grit and preferably 8000 grit. You don’t need to fuss with the entire surface; just the first 1/8” to 1/4” along the cutting edge is all that matters. You also need to put a final honing on the bevel edge itself. It may look sharp, but it needs to be honed, again, ideally to 8000 grit. The goal is to get your cutting edge to as close as possible to a zero degree radius. Sharpening is too often the deal breaker that dissuades woodworkers from trying hand tools. This in unfortunate, for it requires little monetary investment to get started, is not particularly difficult to learn, and can be accomplished rather quickly with surprisingly good results. For detailed information on the how-to of sharpening, I recommend investing in one (or both) of the outstanding books on the subject by Ron Hock or Leonard Lee. Chris Schwarz has also written a number of fantastic articles on planes and sharpening plane irons. If all you want to know is what bevel angle to sharpen on your plane iron, make it 25º and call it a day. But if you want to better understand the reasoning behind the geometry and some of the variations possible, read on. In order to master your tools, it’s helpful to understand the principles behind the geometry at play. So, first a few concepts and then we’ll tie them all together. First things First – Before you can determine the optimal angle at which your plan iron should be sharpened, you first need to know the angle at which it sits in the plane. Plane irons are held in place against the frog via a clamping device called the lever cap. The frog is attached to the base, or sole, of the plane and provides an immovable seat for the iron. The angle of the frog face is not adjustable, so it must be considered a constant. On standard bench planes, the angle is usually 45º while on low angle planes it is typically a very shallow 12º. This angle is traditionally referred to as the ‘pitch’ of the plane. Here’s a summary table of the different pitches and their intended use. Bevel Up vs. Bevel Down – All planes fall into one of two categories – Bevel Down and Bevel Up. Bevel down planes have irons that are situated with the bevel angle facing down, while the irons on bevel up planes are positioned with the bevel angle facing up. Most bench planes are bevel down while most block planes are bevel up. Specialty planes can go either way, depending on their intended purpose. There are some advantages to the bevel up configuration, but we’ll cover that later. Regardless of whether the plane is bevel up or bevel down, the angle of the frog face (upon which the iron sits) is an important determining factor in determining the desired bevel angle. As stated above, the vast majority of bench planes have frogs with a 45º bed, meaning the cutting iron sits at a 45 degree angle from the work surface. Since these bench planes are bevel down, changing the bevel angle doesn’t change the pitch, or angle of attack – that’s essentially fixed at 45 degrees. Changing the bevel angle does, however, change the relief angle, or clearance behind the iron. Bevel Down Planes – Since the irons on most bench planes are positioned bevel down, this is the most common configuration faced when sharpening. Because the un-beveled side of the iron is positioned up (i.e., bevel side down), the angle of attack is the same regardless of the angle at which the bevel is sharpened. That doesn’t mean the bevel angle is completely unimportant; durability, for example, is still a consideration. The bevel angle is, however, less critical than it is on bevel up planes. That said, there are still a few tricks you can employ to fine tune your angle of cut, but more on that later. The standard primary bevel angle for bevel down bench planes is 25 degrees. This offers a good balance of shearing action and durability while providing an adequate relief angle (behind the cut). 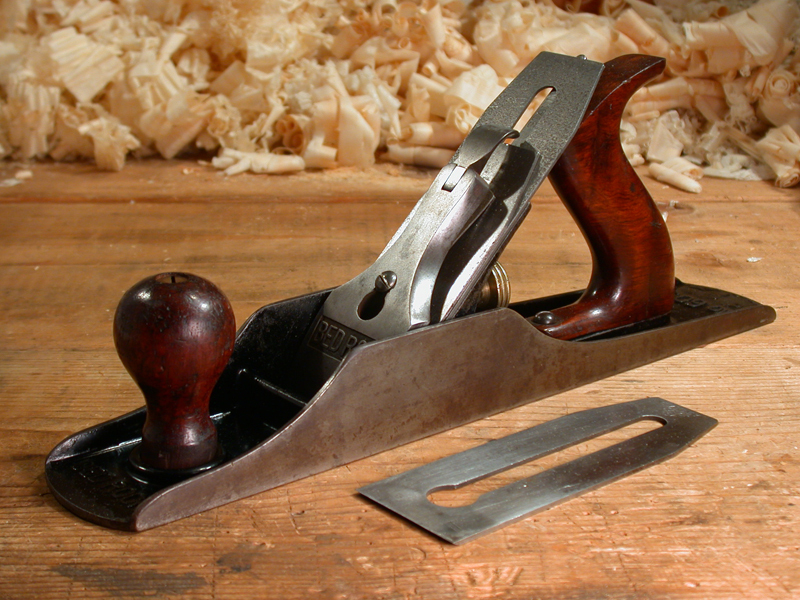 Bevel Up Planes – Block planes have the iron positioned bevel up, but they’re not the only planes with this configuration. Low angle bench planes, including the Stanley no. 62 and the Sargent no. 514 were bevel up, as are several models made today by Veritas. There is an advantage with bevel up irons in that the angle of the bevel can be changed to affect a change in the angle of cut. This provides a measure of flexibility that bevel down planes don’t have, at least not to the same extent. While there is more to consider in edge geometry than just the angle of cut (i.e., durability), you could reasonably sharpen the bevel on the iron of a low angle block plane iron to 33 degrees. Given its 12º bed angle, you would end up with an angle of cut of 45 degrees (12º+33º=45º), the same as on a standard angle plane. By contrast, to accomplish a low angle of cut using a standard angle plane, you’d have to sharpen the bevel at a very shallow 17 degrees (20º+17º=37º). Durability of such a thin cutting edge would be problematic with most woods. See “Beyond the Standard” below for information on adding secondary bevels (micro-bevels) and back-bevels. 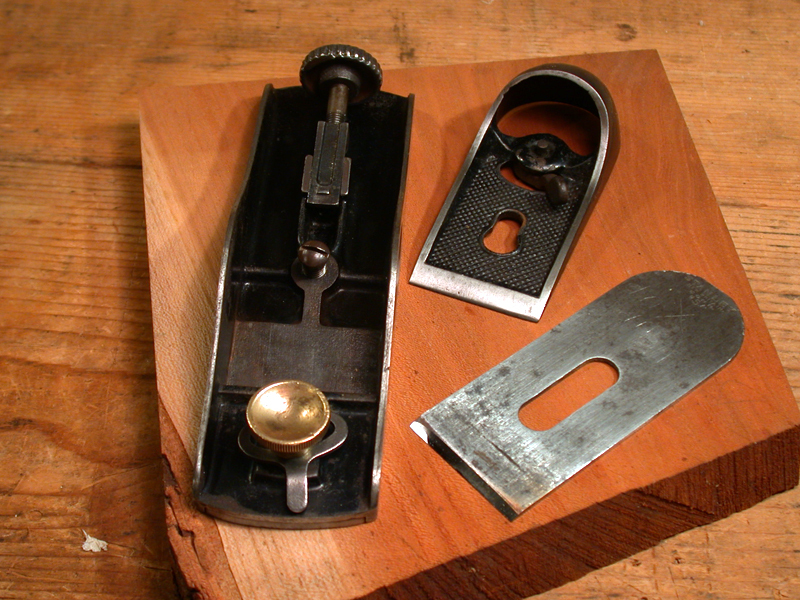 The table below shows the three most common bench and block plane types and the proper angles at which to sharpen the irons. Secondary/Micro-Bevels – The terms secondary bevel and micro-bevel refer to the same thing. Secondary bevels are a very shallow bevel along the cutting edge of the primary bevel. These angles, usually 1º to 3º, serve primarily as an aid in honing. It takes considerably less time and effort to final hone a small secondary bevel that it does the entire primary bevel. They also make honing touch ups a snap. As long as the edge has not been damaged, it’s quick and easy work to re-establish a keen edge on the secondary bevel with a few strokes on a sharpening stone. On a bevel down plane, adding a secondary bevel affects no change in the angle of cut. The only thing it changes ever so slightly is the relief angle – the angle between the back side (bevel side) of the iron and the work surface. It also slightly reduces the total bevel angle on the iron itself, but should not be enough to affect durability of the edge. On most planes the addition or subtraction of a couple of degrees of bevel angle is not going to make any difference. Some people will tell you you can’t (or shouldn’t) put a secondary bevel on a bevel up iron. That’s nonsense. If you’re that concerned with the cutting angle, sharpen your primary angle a few degrees shallower so the secondary angle brings you back to 25º. I’ve never experienced a problem with a secondary bevel on a bevel up iron, and it’s a sharpening technique I apply consistently. Back Bevels – Back bevels can be added for a couple of reasons. On a bevel down plane, (unlike the secondary bevel) adding a back bevel will affect the angle of cut. This is something you can use to your advantage. For example, with the frog fixed at a 45º angle, adding a 5º back bevel increases the angle of cut from 45º to 50º. This technique can be used if you’re working with harder woods or wood with difficult grain. Back bevels on bevel up irons won’t change the angle of cut, but they do change very slightly the relief angle and the bevel angle of the iron itself. Again, a couple of degrees difference should not adversely effect the durability of the edge. Wrapping up, the vast majority of both bench and block planes can be sharpened with a 25º bevel angle. However, with a little experimentation, you may find that making some adjustments to the geometry helps overcome challenges presented by both difficult wood and less than perfect plane irons. Don’t be afraid to experiment. That’s the best way to learn. Hock, Ron, Back Bevels and Plane Geometry, 2010. Whelan, John, The Cutting Action of Plane Blades, 1993.
thank u so much too.. same problem..same solution.. feel a bit stupid. but this saved me alot. made a wooden handplaner couse my bought, iron one, didnt give me the result i wanted. Still using the original blade circa 1952 in my Stanley bench plane. my question is , what is the likelihood of this being a better steel than a current day replacement. There’s nothing wrong with using the vintage blade in your Stanley plane, but there’s no comparison when it comes to modern steel alloys. Modern alloys, such as O1 and A2 are superior for edge retention, and the better made blades from Hock, Lie-Nielson, and Veritas are thicker and ground to a much higher degree of precision than your 1950s Stanley, making them much easier to properly sharpen. Thanks very much. Very clear, very useful. And now I know why a secondary bevel is useful. 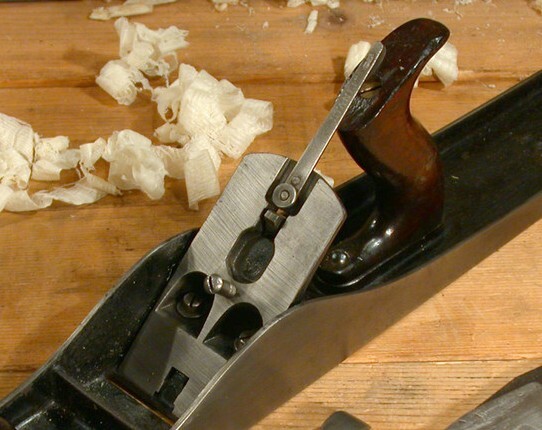 I believe all or most the combination plane irons were sharpened at 35 degrees, however, anywhere in that general range should work – it’s not critical.